First a disclaimer: A lot of people say grass or grain fed beef, but that does not mean that the cow was fed grain its entire life. Most cattle live off grass for the majority of their life and then switch to grain once in the feed lot. We’ll get to the specifics of how that happens later. As consumers, we are all worried about what we eat and the health benefits/risks associated with that. One of these worries is surrounding grass-fed vs grain-fed cattle, whether it be health concerns or animal welfare concerns. All cattle start out living similar lives; they are born, drink milk from their mothers and then eat grass after being weaned. This continues for about 6-12 months, after that, grain-finished cattle are moved to feedlots. Feedlots are depicted as horrible, disgusting and cramped places (but that’s a topic for another blog post). There is actually more room in feedlot pens than most people think. At feedlots the cattle are rapidly fattened up with grain, usually made with corn or soy. When the cattle are first brought to the feed lot they are given feed with high forage/silage content and low grain content to help their bodies adjust to the new diet. The grain portion of the diet steadily increases until the cattle are primarily eating grain. This process occurs over a 3-6 month period. 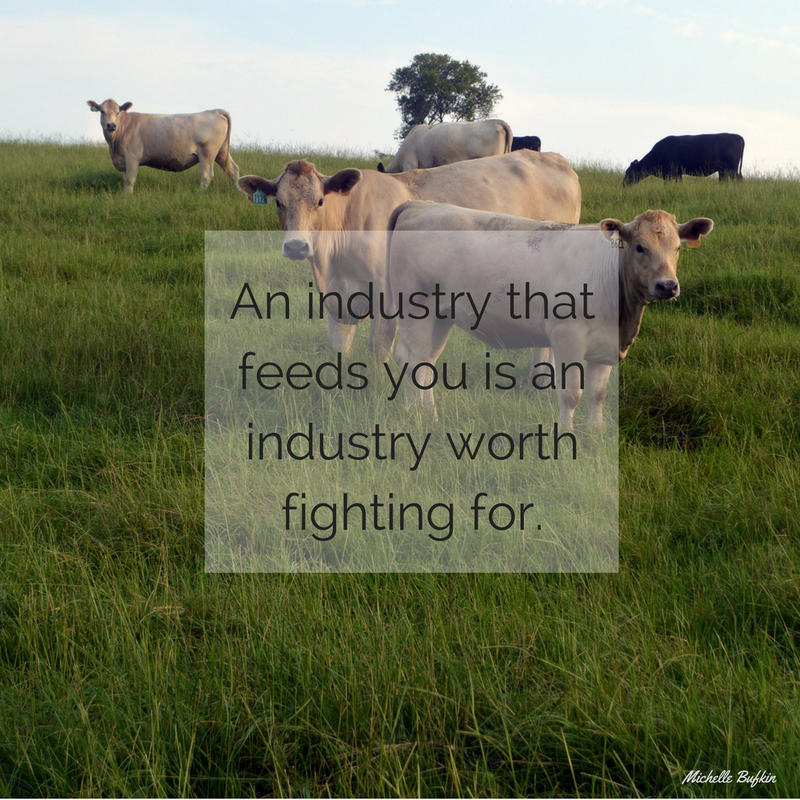 If you are curious about finding out more about feedlots before my next post visit this site. Just like grain-finished cattle grass-finished cattle spend the first ~12 months of their lives in the same way. The only difference is that instead of being sent off to a feedlot they are “finished” or “grown out” in a grass pasture. This means that they eat grass for the remainder of their life, until slaughter. This entire process can take upwards of a year and a lot of land. 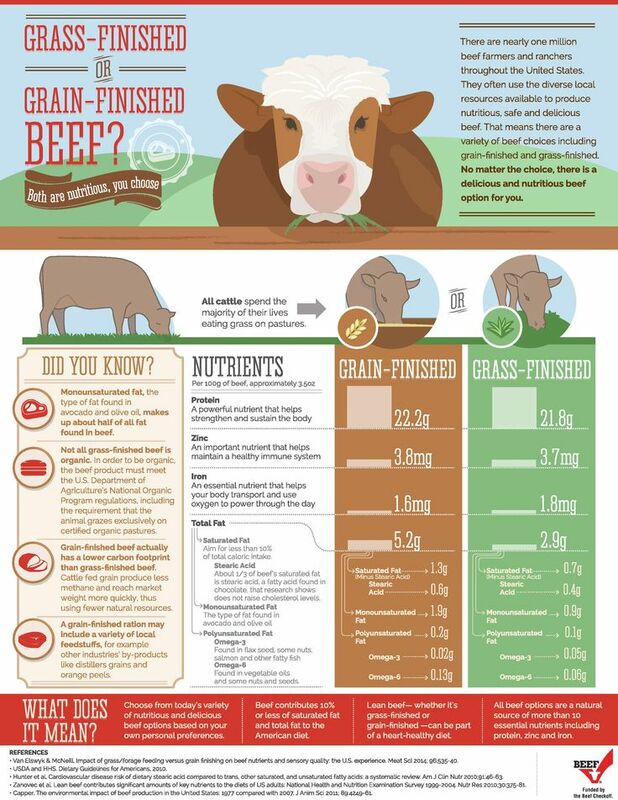 Texas A&M University did a study on the nutritional differences on ground beef from grass-fed and grain-fed cattle. As you can see from the table, grain-fed cattle have a higher omega-3 fatty acid concentration and a higher total saturated and trans-fat content, while grass-fed cattle have a higher oleic acid concentration and lower saturated and trans-fat content. The study continued on to say that the effect of the ground beef on cholesterol was minimal, and neither type increased risk for CVD or type II diabetes. “So, at this point, there is no scientific evidence to support the claims that ground beef from grass-fed cattle is a healthier alternative to ground beef from conventional raised, grain-fed cattle” said Stephen Smith, Regents Professor at the TAMU Department of Animal Science. So as of the research we have right now, there is no health benefits to choosing grass-fed beef. It is solely a choice of preference. If you prefer the taste of grass-fed beef, then by all means eat it. But do not feel like you have to because of health benefits or animal welfare.